L'attitude et la marche dans l'hémiplégie hystérique. Gilles de la Tourette, Georges Albert Brutus Édouard, 1857-1904. Description : 1-12 p., [2 l.] pl. ; ill.: 2 photo., 10 fig. ; 25.5 cm. 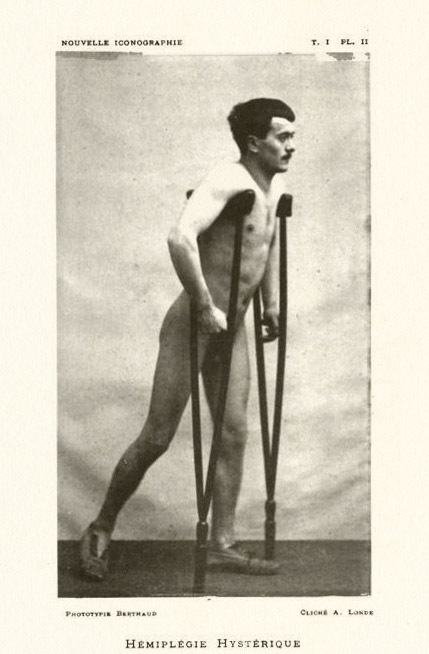 Photographs : 2 phototypes, each of a clinical male subject on crutches. Subject : Brain function — Conversion disorders; paralysis. Author caption: GILLES DE LA TOURETTE, Chef de clinique des maladies du système nerveux. Eponym: Tourette's syndrome — conversion disorder characterised by echolalia, pallilalia and coprolalia. Reference: Gilles de la Tourette (1886), Études cliniques et physiologiques sur la marche..etc. Paris: Delahaye et Lecrosnier. Reference: Babinski, J. 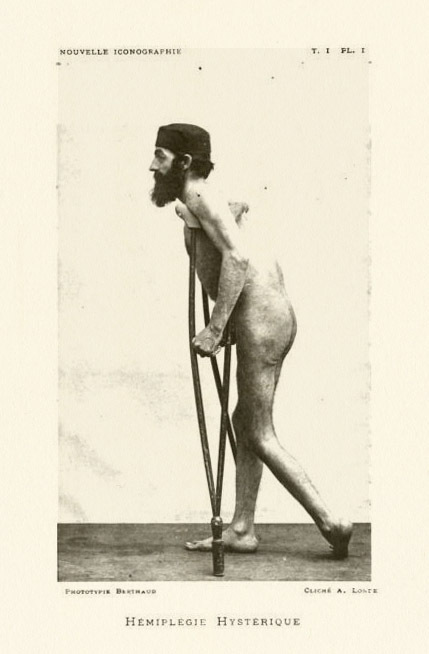 (1886), De L'atrophie musculaire dans le paralysies hystériques. Journal: Arch. Neur., vol. xii. Reference: Todd, Robert B. (1856), Clinical lectures on paralysis, certain diseases of the brain, ..etc. London: John Churchill. Gilles de la Tourette inaugurated the journal he co-founded with this paper on the gait movement in transient hemiparesis following head trauma. Two male subjects were studied, the first a 47 year-old botanist who was wounded during the disastrous colonising expedition sponsored by the Marquis Du Rays in 1879. The second subject was a 21 year old mason who fell 12 feet from a scaffold. The paper continues a study of gait movement in nervous disorders which Tourette began with his doctoral thesis, promoted by his mentor Charcot and published in 1886.